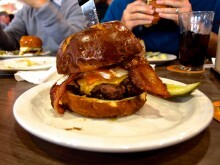 Slater’s 50/50 first jumped on my radar when they released the ‘Merica Burger back in July. 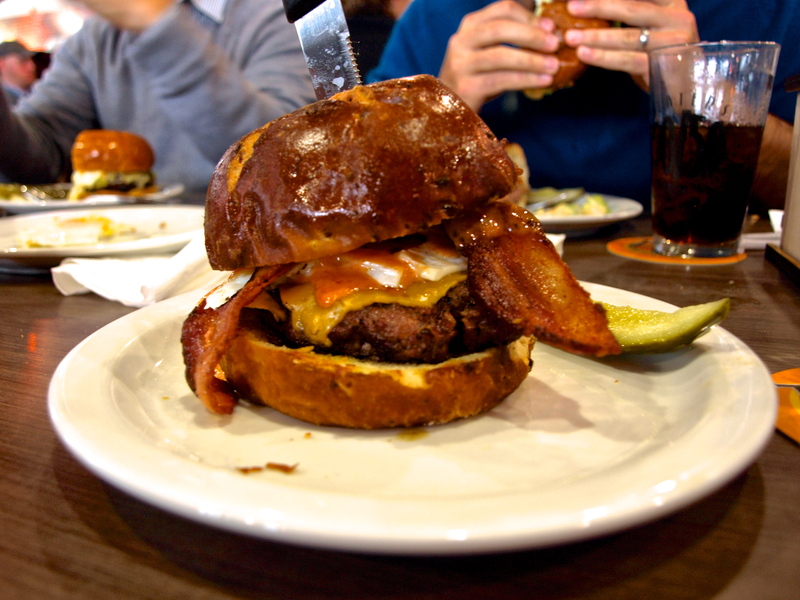 This burger was composed of an entire bacon patty, loaded up with even more bacon. But Slater’s, only existed in Orange County and San Diego, thus only serving these burgers down there. The opportunity for a ‘Merica passed me by, but just a couple weeks ago Slater’s opened their first outpost in LA County. Sure, it’s probably just as far away from me as Orange County, seeing as it’s in Pasadena, but I didn’t want to miss out on the place and met up with some fellow burger lovers for lunch. More like anti-vampire dip. Amirite?! In case you’re wondering where the name Slater’s 50/50 comes from, I can tell you it is not at all related to A.C. Slater from Saved by the Bell. The guy who started it is named Slater, but more important than that is the 50/50, which is 50% beef and 50% bacon. 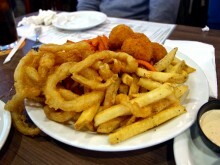 It sounds like a shtick, and it just might be, but Slater’s has more than just that burger. Take the Vampire Dip, which we started our meal with. 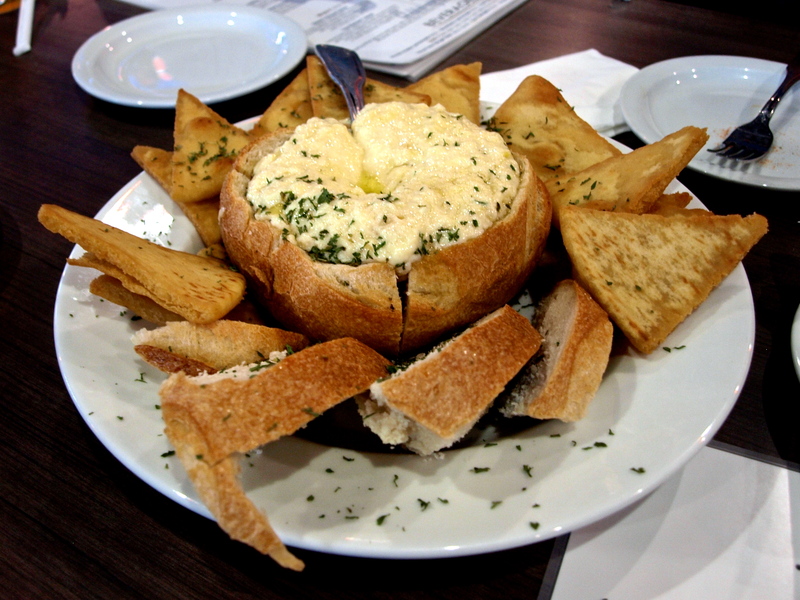 It’s a garlic, cheese and artichoke dip in a bread bowl with pita chips. I know you’re thinking artichokes are vegetables, idiot. And I won’t deny that, but I figured I had to give it a try and if there are artichokes in there, they were so overwhelmed by cheese that they may as well have not existed. 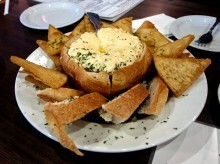 While this was good, I definitely felt there was a low dip-to-bread ratio that could have used rectifying. This stuff was good, but would have been better as a free side. We then split a sampler of their sides, which we chose to be their fries, sweet potato fries, onion rings and fried bacon mac and cheese balls. As an FYI, the burgers don’t come with a side, so this was an extra in the purchase. Each side came with its own unique dipping sauce that seemed to be matched perfectly to its side. The bacon mac and cheese balls easily took the cake as my favorite side, but the regular fries and onion rings definitely got the job done as well. Plus, the bacon ketchup was simply awesome. Yes, I do keep Kosher. Why do you ask? 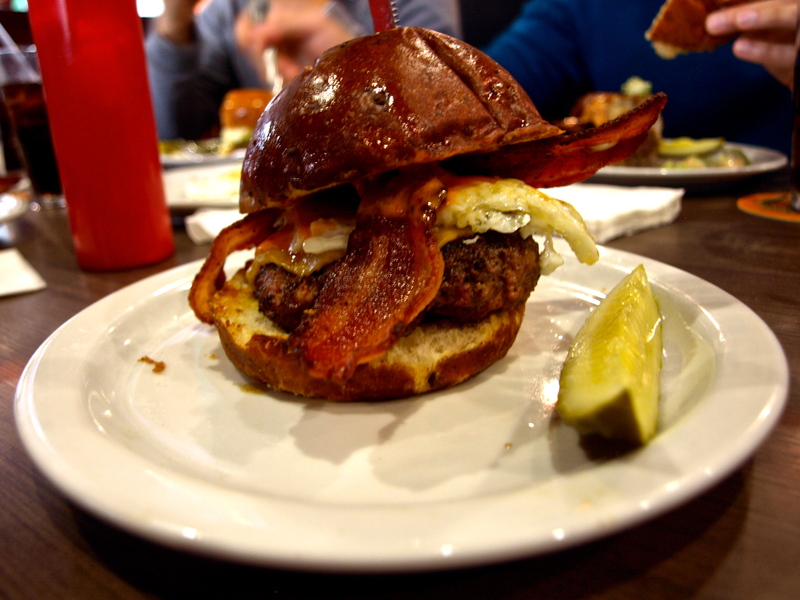 Finally came the main event, and I wasn’t content with just a 50/50 burger, I wanted more bacon. Fortunately, Slater’s has a solution for that called the B’ B’ B’ Bacon Burger (just say that in a Porky the Pig voice in your head and you’ll get the picture). In addition to the signature patty, this guy comes with bacon American cheese, a sunny side up egg, some strips of bacon, bacon island dressing and it’s all in a bacon pretzel bun. From the looks of it, it’s like dying and going to heaven with every last bit of swine on earth. And it tastes like it too. The first bite is sheer bacon bliss, and less salty than I expected. There is a hitch to the whole bacon burger concept though, and that’s the fact that they can’t be cooked medium rare due to health codes. It’s a good thing, because I don’t want worms, but the burger suffers for it. It’s just not juicy like a full beef burger and although the bacon island dressing tries to keep things real, it is unable to make up for the patty. This is not to say that the patty is bad. In fact, as far as flavor goes it is badass. But, upon reaching the 3/4 point in the burger, I have to say I was feeling a bit overwhelmed. Yes, there is such a thing as too much bacon and Slater’s 50/50 found it. Yet, while B’ B’ B’ Bacon was not the bacon burger nirvana I had hoped to achieve, I am undoubtedly impressed by Slater’s. The bacon burger shtick brought me in, but I found a menu of all sorts of burgers and other dishes that will bring me back. In fact, I’m not sure I’m done with the B’ B’ B’ Bacon Burger yet, only next time I think I’ll try it with a regular patty to keep things real. And no, I didn’t forget that my burger came with a damn pickle. Are you kidding me Slater’s? !